This article is about the section of Interstate 10 in California. For the entire route, see Interstate 10. Interstate 10 (I-10), a major east–west Interstate Highway, runs in the U.S. state of California east from Santa Monica, on the Pacific Ocean, through Los Angeles and San Bernardino to the border with Arizona. In the Greater Los Angeles area, it is known as the Santa Monica Freeway and the San Bernardino Freeway, linked by a short concurrency on Interstate 5 (the Golden State Freeway) at the East Los Angeles Interchange. Interstate 10 also has portions designated as either the Rosa Parks Freeway, the Redlands Freeway, or the Christopher Columbus Transcontinental Highway. (a) Route 1 in Santa Monica to Route 5 near Seventh Street in Los Angeles. (b) Route 101 near Mission Road in Los Angeles to the Arizona state line at the Colorado River via the vicinity of Monterey Park, Pomona, Colton, Indio, and Chiriaco Summit and via Blythe. Despite the legislative definition, Caltrans connects the two sections of the route by cosigning I-10 down Interstate 5 between the East LA Interchange and the Santa Monica Freeway, negating a section of the San Bernardino Freeway west of I-5. This short section of Route 10 between Route 5 and Route 101, which was formerly defined as Route 110 (signed as Interstate 110) until 1968, is signed overhead for I-10 eastbound and for U.S. 101 westbound. This I-5/I-10 cosigning is consistent with the Federal Highway Administration's Interstate Highway route logs that such an overlap exists for the segment of I-10 in California. I-10 is part of the California Freeway and Expressway System, and is part of the National Highway System, a network of highways that are considered essential to the country's economy, defense, and mobility by the Federal Highway Administration. I-10 is eligible to be included in the State Scenic Highway System, but it is not officially designated as a scenic highway by the California Department of Transportation. The Santa Monica Freeway is Route 10 from Route 1 to Route 5, as named by the State Highway Commission on April 25, 1957. 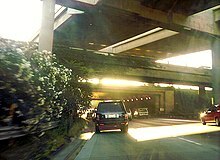 The section between the Harbor (I-110) and San Diego (I-405) freeways is also signed as the Rosa Parks Freeway, after the African American civil rights activist. The I-10 freeway is signed as the Christopher Columbus Transcontinental Highway in Santa Monica. The Santa Monica Freeway is the westernmost segment of Interstate 10 and a small section of State Route 1, beginning at the McClure Tunnel in Santa Monica, California and ending southeast of downtown Los Angeles at the East Los Angeles Interchange. Downtown Los Angeles skyline as seen from the freeway. A slight (smaller than usual rush hour) traffic jam is ahead. Interstate 10 begins in the city of Santa Monica when State Route 1 turns into a freeway and heads east. SR 1 exits onto Lincoln Boulevard and heads south while I-10 continues east. Soon after it enters the city of Los Angeles, I-10 has a four-level interchange with Interstate 405. Interstate 10 then continues through Sawtelle, Rancho Park, Cheviot Hills, Beverlywood and Crestview in West Los Angeles, Lafayette Square and Wellington Square in Mid-City, Arlington Heights, West Adams and Jefferson Park into downtown Los Angeles. On the western edge of downtown, I-10 has an interchange with Interstate 110 to the south and State Route 110 to the north. I-10 then travels along the southern edge of downtown to the East Los Angeles Interchange. At the East Los Angeles Interchange, State Route 60 diverges east towards Riverside and Pomona. I-10 then turns north, running concurrently with Interstate 5 for approximately one mile. Then, Interstate 10 heads east and merges with the traffic from the spur to US 101 onto the San Bernardino Freeway. The freeway is 14 lanes wide (two local, five express in each direction) from the Harbor Freeway (Interstate 110) interchange to the Arlington Avenue off-ramp. Most of these lanes are full at peak travel times (even on Saturdays). The remainder of the freeway varies between eight and 10 lanes in width. The whole freeway (though a much smaller version) opened in 1965, with a formal dedication held in 1966. While the construction of the Century Freeway several miles to the south reduced traffic congestion to a considerable amount by creating an alternate route from downtown to the Los Angeles International Airport, the Santa Monica Freeway is still one of the busiest freeways in the world. 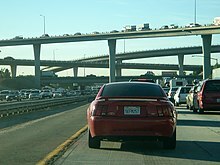 All three freeway-to-freeway interchanges along its length are notorious for their congestion, and are routinely ranked among the top 10 most congested spots in the United States. Due to the high traffic volume, car accidents are so common that Caltrans has constructed special Accident Investigation Sites separated from the freeway by fences. These enable the California Highway Patrol to quickly clear accidents from the through traffic lanes, and the fences reduce congestion by preventing rubbernecking (in which vehicles slow down so their occupants can watch the accident investigation). The Santa Monica Freeway is considered the border between West Los Angeles and South Los Angeles. Part of the freeway also skims the Byzantine-Latino quarter, which is home to many immigrants affiliated with the Eastern Orthodox Church. Interstate 10 heads east from the Downtown Los Angeles Eastside Los Angeles region, with two HOV lanes paralleling it on the north side called the El Monte Busway. These roadways extend to Alameda Street on US 101, following the spur west to where I-10 passes California State University Los Angeles. However, after the Interstate 710 interchange, these lanes merge back into the typical left lanes of each roadway. East of Interstate 710, I-10 continues through Monterey Park, Alhambra, Rosemead, San Gabriel, El Monte, and Baldwin Park before intersecting with Interstate 605. It then travels through West Covina and Covina before heading up Kellogg Hill into San Dimas, where I-10 intersects with State Route 57 (formerly part of Interstate 210) and State Route 71 at the Kellogg Interchange. I-10 then heads east through Pomona and Claremont, leaving Los Angeles County to enter San Bernardino County. Interchange with the Ontario Freeway (I-15) as seen by west-bound traffic on the San Bernardino Freeway. In San Bernardino County, Interstate 10 travels through Montclair, Upland, and Ontario, providing access to Ontario International Airport. I-10 then has a four-level interchange with Interstate 15 before traveling through Fontana, Rialto, and Colton. I-10 then intersects with Interstate 215 before briefly entering San Bernardino city proper and traveling through Loma Linda and Redlands. In Redlands, I-10 intersects with the State Route 210 freeway (future Interstate 210) and with State Route 38 before entering Yucaipa and eventually Riverside County. 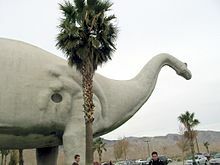 Cabazon Dinosaurs is a roadside attraction at the Main Street exit in Cabazon. In Riverside County, I-10 goes through Calimesa before entering Beaumont and merging with the eastern end of State Route 60 (itself formerly the California segment of US 60). In Banning, I-10 has a diamond intersection with State Route 243 before passing through San Gorgonio Pass between the San Bernardino Mountains and the San Jacinto Mountains and entering Palm Springs. I-10 intersects with the northern end of State Route 111, whereas I-10 mostly bypasses the city and connects to State Route 62, a major east–west route through the Mojave Desert. I-10 cuts through Cathedral City and passes just outside the city limits of Rancho Mirage, Palm Desert, and Indian Wells before entering Indio. I-10 then has an interchange in Coachella with the northern end of the State Route 86 expressway, which also leads to SR 111. Past Coachella, I-10 traverses the Mojave Desert, with few junctions and no cities. Several miles east and roughly halfway between Indio and Blythe, in the community of Desert Center, I-10 intersects with State Route 177, a turnoff that connects to SR-62. Near the Arizona state line, I-10 meets the terminus of State Route 78. In the city of Blythe, I-10 runs concurrently with U.S. Route 95 as both routes cross the Colorado River into Arizona. I-10 westbound is usually signed as towards San Bernardino and/or Los Angeles in the Mojave Desert. 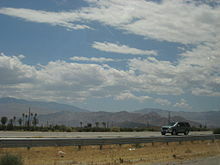 Eastbound, in the San Gorgonio Pass, the signage indicates "Indio, Other Desert Cities", and indicates "Blythe" after Indio; the first sign for Phoenix does not occur until Indio. The route from Indio via Mecca to the Arizona state line near Blythe was defined in 1919 as pre-1964 Legislative Route 64. (Later extensions took LR 64 west along present State Route 74; a 1931 cutoff bypassed Mecca to the north.) LR 26 was extended west from San Bernardino to Los Angeles in 1931, running along an alignment south of the existing US 66/US 99. Neither of these was a signed route until around 1932, when U.S. Route 60 was extended west from Arizona to Los Angeles, running along LR 64 to Indio, LR 26 (with US 99) to Beaumont, pre-1964 Legislative Route 19 to Pomona, and LR 26 to Los Angeles. (The original alignment of LR 26 ran roughly where State Route 60 now is west of Pomona, but an alignment close to present I-10 opened around 1934). 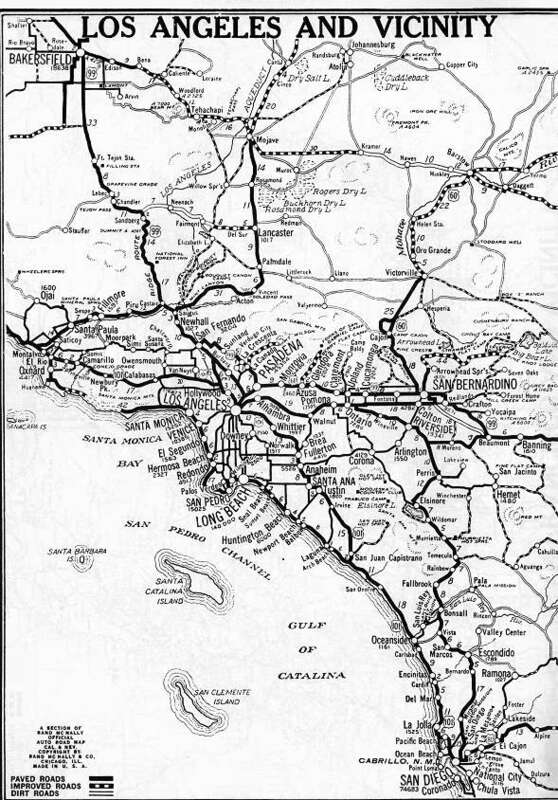 Thus, in 1931, what is now I-10 east of Los Angeles had been defined as LR 26 from Los Angeles to Indio and LR 64 from Indio to Arizona. It was signed as US 99 from San Bernardino to Indio, and US 60 came along around 1932 from Los Angeles to Pomona and from Beaumont to Arizona. U.S. Route 70 was extended west from Arizona ca. 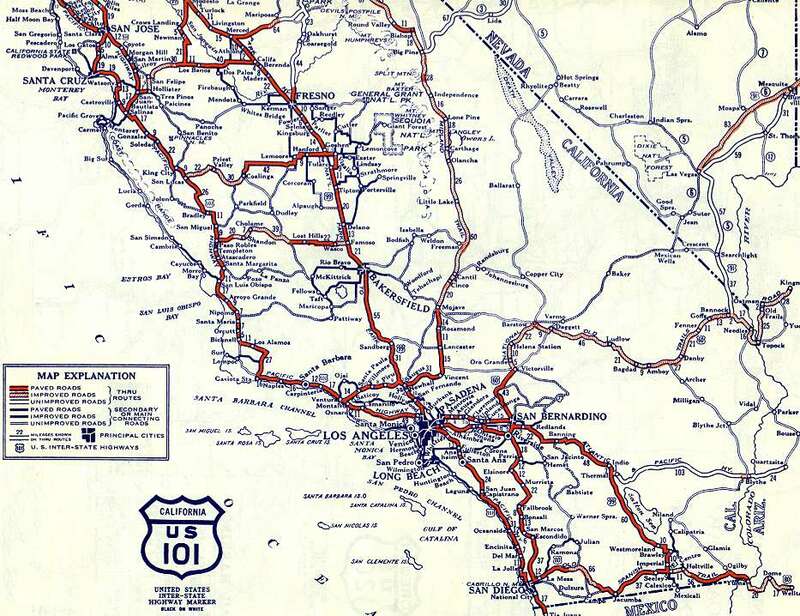 1936 along the whole route to Los Angeles, and, between 1933 and 1942, US 99 moved from US 66 to present I-10 between San Bernardino and Los Angeles, forming a three-way concurrency between Pomona and Los Angeles. Old alignments and names include Valley Boulevard, Ramona Boulevard and Garvey Avenue. 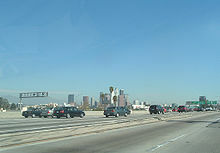 I-10 holds the distinction of being the first freeway in Los Angeles. A four-mile section of today's freeway was built between 1933 and 1935 at a cost of $877,000. The "Ramona Boulevard" highway linked downtown Los Angeles to the communities of the southern San Gabriel Valley. The roadway, which opened on April 20, 1935, was dubbed the "Air Line route," and was seen as a major achievement in traffic design. The route east from Los Angeles was added to the Interstate Highway System on August 7, 1957. It was assigned the I-10 number on August 14, 1957, and the short piece west of I-5 was approved as I-110 on November 10, 1958. By then, most if not all of the San Bernardino Freeway had been completed, and I-10 was signed along the existing freeway along with US 70, US 99, and part of US 60. Those three routes were all removed in the 1964 renumbering, leaving only I-10. The part west of downtown Los Angeles was pre-1964 Legislative Route 173, defined in 1933 from Santa Monica to downtown Los Angeles. It was signed as State Route 26 by 1942, running primarily Olympic Boulevard. It was later replaced by the Santa Monica Freeway, and added to the Interstate Highway System on September 15, 1955. It too was assigned the I-10 number on August 14, 1957. It was completed ca. 1964, and became Route 10 in the 1964 renumbering. Portions of the Santa Monica Freeway going over La Cienega Boulevard collapsed after the Northridge earthquake on January 17, 1994, and were rebuilt using new Seismic-Resistant bridge designs. The El Monte Busway was converted to high occupancy toll (HOT) lanes in 2013 as part of the Metro ExpressLanes project. On July 19, 2015, a bridge carrying the eastbound lanes of I-10 near Desert Center collapsed from floodwater from the remnants of Hurricane Dolores, trapping a vehicle. The I-10 is part of the auto tour route of the Juan Bautista de Anza National Historic Trail, a National Park Service unit in the United States National Historic Trail and National Millennium Trail programs. In 2005, Caltrans began posting signs on roads that overlap with the historic 1776 Juan Bautista de Anza trail route, so that California drivers can now follow the trail. Complete the construction of one high-occupancy vehicle lane in each direction between I-605 and SR 57. Add two tolled express lanes in each direction between the Los Angeles/San Bernardino County line and Ford Street in Redlands. ^ a b Exit number follows I-5 rather than I-10. The legislative definition of Route 10 includes a spur from Interstate 5 (the Golden State Freeway) west to U.S. Route 101 (the Santa Ana Freeway) near downtown Los Angeles. This section of roadway, the westernmost part of the San Bernardino Freeway, was in fact part of the original San Bernardino Freeway, carrying U.S. Route 60, U.S. Route 70 and U.S. Route 99 long before the Golden State Freeway opened. It was added to the Interstate Highway System by 1958 as Interstate 110, but in 1968 it was removed from the system, becoming a Route 10 spur. This road is signed only for the roads it feeds into: US 101 northbound and I-10 eastbound. It has only two interchanges between its ends: a westbound exit off of the spur at Mission Road immediately before merging with U.S. Route 101 northbound, and the eastbound exit for State Street and Soto Street before it merges onto I-10 eastbound—this one is numbered (as exit 19). There is no access from the I-10 spur to I-5. The entire route is in Los Angeles, Los Angeles County. ^ a b c d e Warring, KS (April 18, 2008). "Interstate 10 Freeway Interchanges" (PDF). California Numbered Exit Uniform System. California Department of Transportation. Retrieved February 5, 2009. ^ "2004 Named Freeways, Highways, Structures and Other Appurtenances In California" (PDF). Caltrans. California Department of Transportation. January 2004. pp. 7–8. Archived from the original (PDF) on November 7, 2005. Retrieved December 8, 2017. ^ Adderly, Kevin (December 31, 2014). "Table 1: Main Routes of the Dwight D. Eisenhower National System of Interstate and Defense Highways as of December 31, 2014". Route Log and Finder List. Federal Highway Administration. Retrieved December 6, 2015. ^ California Department of Transportation (September 7, 2011). "Officially Designated State Scenic Highways and Historic Parkways". Sacramento: California Department of Transportation. Retrieved October 20, 2017. ^ California Department of Transportation; California State Transportation Agency (January 2015). 2014 Named Freeways, Highways, Structures and Other Appurtenances in California. Sacramento: California Department of Transportation. pp. 25–26, 28. Archived from the original (PDF) on May 30, 2015. Retrieved May 30, 2015. ^ a b c d e Rand McNally (2008). The Road Atlas (Map). Chicago: Rand McNally. pp. 15, 17, 18–19. ^ a b c d Thomas Brothers (1999). Los Angeles and Orange Counties Street Guide and Directory (Map). Thomas Brothers. pp. 671, 631, 632, 633, 634, 635, 636, 596, 597, 637, 638, 598, 599, 639, 640, 600, 641. ^ Masters, Nathan (September 10, 2012). "Creating the Santa Monica Freeway". KCET. Retrieved July 4, 2016. Photo caption: Opening of the Interstate 10 freeway into Santa Monica on January 5, 1966. ^ Dimassa, Cara Mia (November 27, 2001). "Freeway a Mess? Stop and Take a Look at Yourself". Los Angeles Times. Retrieved July 4, 2016. ^ a b Thomas Brothers (1999). San Bernardino and Riverside Counties Street Guide and Directory (Map). Thomas Brothers. pp. 601, 602, 603, 604, 605, 606, 607, 608, 648, 649, 689, 690, 720, 721, 722, 723, 724, 725, 726, 756, 757, 758, 788, 390, 819, 5410, 5471, 391, 392, 5491. ^ Rand McNally (1926). California (Map). Chicago: Rand McNally. Archived from the original on July 26, 2011. Retrieved November 29, 2011. ^ Rand McNally (1926). Los Angeles and Vicinity (Map). Chicago: Rand McNally. Archived from the original on May 25, 2011. Retrieved November 29, 2011. ^ Masters, Nathan (August 15, 2012). "L.A.'s First Freeways". KCET. Retrieved April 4, 2013. ^ "The Northridge Earthquake: Progress Made, Lessons Learned in Seismic-Resistant Bridge Design". Public Roads. Federal Highway Administration. Summer 1994. Retrieved November 29, 2011. ^ "Metro ExpressLanes to Open on San Bernardino (10) Freeway". Los Angeles: KNBC-TV. February 22, 2013. Retrieved February 28, 2013. ^ Brunell, Natalie; Terlecky, Megan (July 19, 2015). "Bridge Collapses on I-10 in Desert Center, Traps Vehicle". Palm Springs, CA: KESQ-TV. Retrieved July 19, 2015. ^ "Bridge over 10 Fwy East of Coachella Collapses into Flood Waters". Los Angeles: KABC-TV. July 20, 2015. Retrieved July 20, 2015. ^ Caltrans. "San Bernardino Freeway (I-10) High Occupancy Lane Project". State of California. Retrieved November 12, 2018. ^ "I-10 Corridor Project Overview". The I-10 & I-15 Corridor Projects. Retrieved November 14, 2018. ^ Google (May 15, 2015). "Map of the I-10 spur (San Bernardino Freeway)" (Map). Google Maps. Google. Retrieved May 15, 2015. This page was last edited on 11 April 2019, at 22:31 (UTC).